In his best-selling book, "The Sports Gene," author David Epstein offers a groundbreaking exploration into sports science and looks at the relationship between biological abilities and how they influence athletic achievements. Through his exclusive speaking engagements with the American Program Bureau, Epstein describes how applying the principles of high performance science can help business managers, teachers, coaches and others better identify the characteristics most critical to success and how to further develop one’s unique strengths. 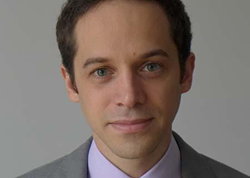 David Epstein - Author of "The Sports Gene"
Epstein’s research and findings are captivating, ultimately dispelling many traditional assumptions about why people excel at certain pursuits in life when others don’t. In his best-selling book, "The Sports Gene," author David Epstein offers a groundbreaking exploration into sports science and looks at the relationship between biological abilities and how they influence athletic achievements. Now speaking exclusively through the American Program Bureau, Epstein is teaching business managers, teachers, coaches and other professionals how they can apply the principles of high performance science to identify the characteristics most critical to success in their own lives, and how those findings can be used to develop everyone’s unique abilities. A former senior writer at Sports Illustrated and current reporter at ProPublica, Epstein is one of the world’s top sports science and medical investigative journalists of our time. Additionally, in spite of Epstein’s challenge to Malcolm Gladwell’s famously popularized 10,000-Hour-Rule — which the two authors debated about in a fascinating panel at the MIT Sloan Sports Analytics Conference — Gladwell nominated The Sports Gene as one of the best books of 2013 and penned an article in The New Yorker addressing Epstein’s thought provoking work. This week at his TED2014 talk in Vancouver, Epstein will further explain the shifting baseline of elite athletes and why the top performers have evolved into better competitors than those of previous generations. Epstein’s research and findings are captivating, ultimately dispelling many traditional assumptions about why people excel at certain pursuits in life when others don’t. His speeches to corporate, college, healthcare and education audiences teach how applying athletic principles to other endeavors can enhance productivity and help organizations think outside the box. The wisdom he shares on how brain sports science can maximize one’s hidden talents can help anyone achieve personal and professional success. Organizations wishing to book David Epstein should contact the American Program Bureau at 1-617-614-1600 for information on available dates and program topics. For more information on American Program Bureau, please visit http://www.apbspeakers.com. For a profile on Epstein, please visit http://www.apbspeakers.com/speaker/david-epstein. Founded in 1965, American Program Bureau has long provided a vocal platform for the world’s most forward thinking and motivational voices in business and leadership, including Robert Safian, Daymond John, Chris Hughes, Jared Cohen and others. The global leader in the professional speaking industry, APB exclusively represents hundreds of speakers and serves thousands of clients worldwide. Today, APB represents the top thought leaders across the realms of business, healthcare, technology, government and entertainment, including Mikhail Gorbachev, Archbishop Desmond Tutu, Richard Branson, Michael Douglas and many more.